in my experience taking pictures around manila, i have had to do most of them on the sly. restaurants now tolerate you taking pictures of the food and interiors, but a lot of stores and malls don't like it. abroad, i have been stopped in madrid from taking pictures of the outside of an open-air shopping center. in istanbul, a lot of stall owners invited me to take pictures of their wares—except for one that was selling copies of birkins and kellys haha! but i found new york city to be the most tolerable. the city is crawling with tourists, posing with and taking pictures of everything outdoors AND indoors, and not once did i see anyone stopped. which was refreshing. hell, i was even able to organize a fashion shoot inside the museum of modern art—without permission! which was actually quite bold. People in Hong Kong went to the streets on Sunday, but unlike previous mass rallies in the city, this one wasn’t about politics or democracy. The cause: The right to take photos in front of luxury retailer Dolce & Gabbana. 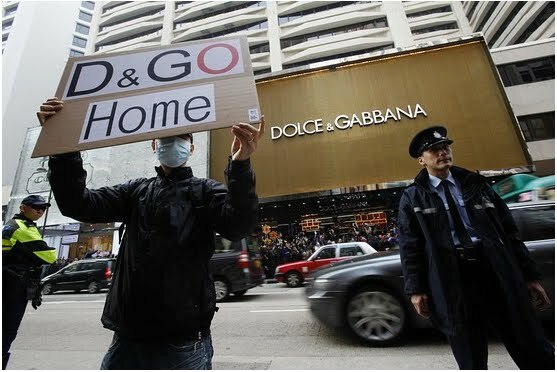 More than 1,000 people showed up outside the Italian brand’s flagship store on Canton Road after the retailer reportedly prevented people taking pictures of its store front earlier in the week. The protest forced the store to shut at 3 p.m. as the crowds swelled. The rally was organized on Facebook after local newspaper Apple Daily reported that Hong Kong citizens were banned from taking pictures of window displays, even if the photos were taken from the public street. Apple Daily also posted a video that showed security guards telling journalists to stop snapping pictures from the sidewalk. According to the report, representatives of the retailer allegedly defended its policy, arguing that it was trying to protect its intellectual property even though the pictures were taken from the public street. However, the defense was undercut further when the company said foreign and mainland Chinese tourists were exceptions to the photo ban. Why the company’s security drew the line between local Hong Kongers and mainland tourists is not exactly clear, but some have speculated it has less to do with copyright infringement and more to with placating high-rollers from China. Luxury companies in Hong Kong have been doing brisk business, mostly selling to Chinese tourists from the mainland who flock to Hong Kong’s lower-taxed shopping. The shop which was the focus of public anger is located on Canton Road, a luxury strip so busy that Chinese tourists are often asked by store bouncers to queue up on the sidewalks. While some have called the incident an overreaction, academics say that the large turnout on Sunday underscores the continuing struggle among Hong Kongers to protect against infringements to freedoms and rights they are afforded as a special administrative region of China. “Since the city’s handover to China in 1997, Hong Kong people have faced a lot of setbacks in their fight for democracy and freedom. As there is no universal suffrage and other political rights, they cling very hard on to what is left for them, such as the fundamental right to enjoy public space,” said Chung Kim-wah, director of Hong Kong Polytechnic University’s Centre for Social Policies Studies. Mr. Chung said the incident was also a platform for the locals to express their frustrations over the mainland Chinese, who are playing an increasingly significant role in the city. “Mainland mothers come to give birth, mainland buyers are buying the most luxurious properties in Hong Kong. The mainland is basically the backbone of our economy. Hong Kong people are afraid that their roles will be increasingly taken over by the mainlanders, but they have nowhere to express this fear,” he said. Harbour City, owned by blue-chip conglomerate Wharf (Holdings) Ltd., said it has over the past few days reminded its tenants that they shouldn’t intervene the activities of people outside their shops unless the activities affect their customers or other passers-by. Late Sunday, Dolce & Gabbana issued a press release to try to diffuse the situation. “We wish to underline that our company has not taken part in any action aiming at offending the Hong Kong public,” it said. But in the minds of Hong Kongers, it already has. – Polly Hui contributed to this article.